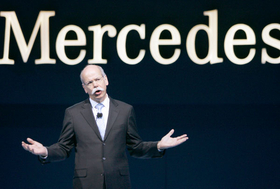 DETROIT -- Despite the tough times facing the auto industry, Daimler CEO Dieter Zetsche says his company will not make short-term cuts in expenditures that would jeopardize the carmaker's long-term strategy. Instead, Zetsche said at the auto show here, that he would focus strongly on green cars and would launch at least one new hybrid vehicle a year. "Our focal point will be green across the range," Zetsche said. "We will not reinvent the wheel, but there are still a lot of innovative solutions to come." Zetsche also said investment in 2009 would go to new products, technology and emerging markets in particular. "We're going to keep the pedal to the metal as far as new products are concerned," he said. The first car in the Daimler's new-product offensive will be the Mercedes S400 BlueHybrid sedan, which is due to arrive later this year. The hybrid version of the upper-premium S class is poised to be the first mainstream hybrid equipped with a lithium-ion battery pack. Used primarily in consumer electronics, lithium-ion battery is being adapted to powering a number of upcoming electric-drive vehicles, such as the Chevrolet Volt. Zetsche said he didn't plan to expand marketing efforts to improve public awareness of Daimler's environmental credentials.